On Friday, Patrick and I were treated to a tour of the work sites of the City Rail Link. Thanks to Scott, Dale and Glen for showing us around. For most of us, our experience of the works at Britomart the large blue walls at the top of the main stairs, the temporary station building, or the hoardings that surround Lower Queen St. But behind all those walls and hoardings an impressive feat of engineering is being undertaken to build the tunnels while preserving the historic Chief Post Office. If you follow the City Rail Link website or social media pages, you’ll likely have seen various images of the works underway at the station. I’ve always found them a bit difficult to follow as it’s hard to get perspective of what you’re looking at in the confined spaces of the former Chief Post Office (CPO). Looking at the works in person gave me a much greater understanding of the scale and complexity of what’s going on. 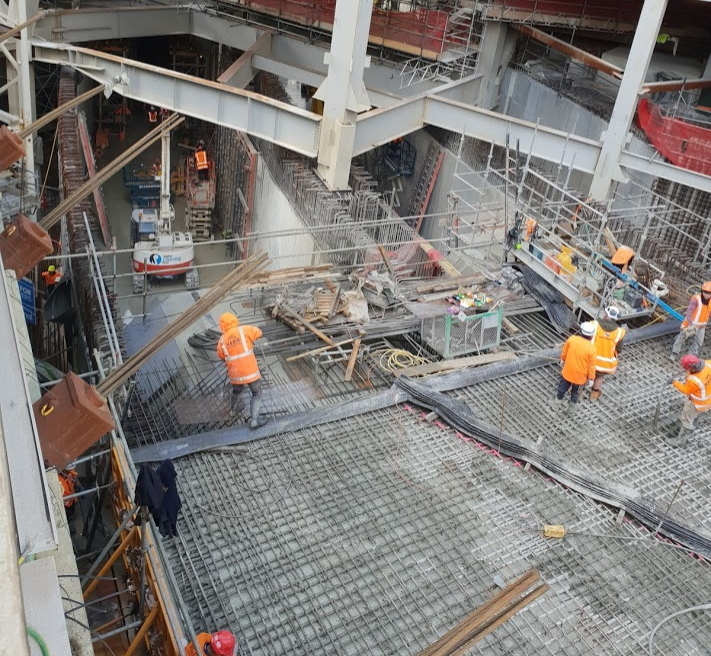 Essentially, the contractors are having to rebuild parts of the station three times. It started with them having to cut out and lower the floor, without disturbing the existing foundations. This was needed so that there was enough room to get the piling rig inside the building. Moving large pieces of machinery around in such a tight space must have created more than a few nervous moments but crews were successful and piling was completed a few months ago. The next step was to shift the existing pillars onto those new foundations. To do this they had to cut back to the original steel in the pillars and attach brackets. Powerful jacks lifted the pillars by just 1mm, just enough to take the pressure off the old foundations and slide some steel beams under them. Throughout the entire project they’ve installed hundreds of prisms around the building to measure movement to ensure the building isn’t moving in a way they didn’t intend. So far they say, things are looking good. In the image below you can see the steel beams that have been installed. 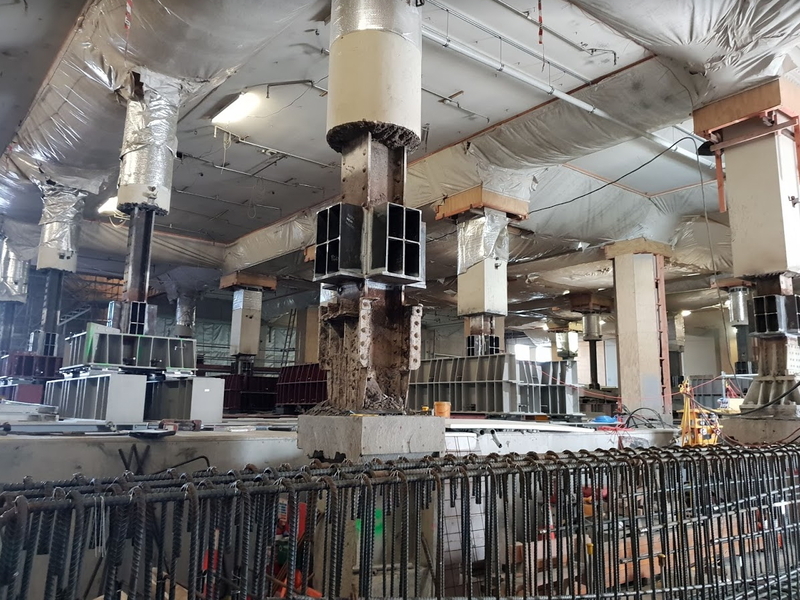 This is looking out towards Lower Queen St and the tunnel that connects to Platform 1 will essentially pass straight down the middle of these pillars. You can also see how much the floor has been lowered if you look to the right of the image. That thick concrete line and the door are where the old floor used to be. This process has been repeated for all of the pillars within the station but the dealing with the facade is a bit different because it’s much heavier and more difficult. In that case, large, heavily engineered concrete beams are being built both inside and outside of the CPO. They will be joined together and clamp the facade in a vice like grip so it can be lifted and separated from its original foundations. Below is some of the original steel framework that has been exposed along with reinforcing steel for one of the concrete beams being built to hold up the facade. You can also see at the back left of the shot the stairs that the image above was taken from. you can also see the care that’s being taken to protect the decorative elements on the ceiling. 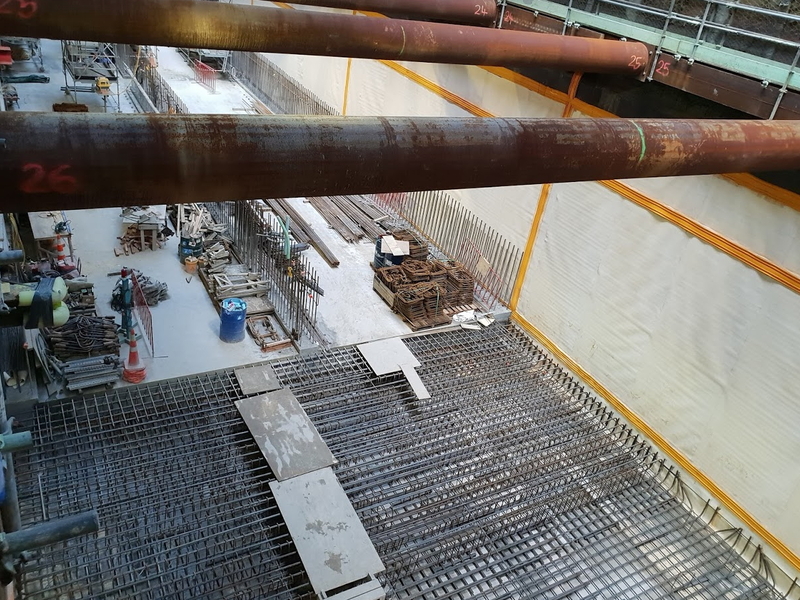 Apart from building the tunnels, one of the big benefits of all of this work is when complete, the previously raised section of floor in the middle of the CPO will be removed, apparently not an easy feat. Removing that was essential to help improve pedestrian flow as the station gets even busier. The station gates will also be moved up to the ground floor level. We didn’t go onto the Commercial Bay site but did get a close look at it from the side of Albert St. Workers were busy pouring the concrete roof on the section of the tunnels where they’ll join Albert St.
One interesting thing I learned about the development is that it doesn’t actually touch the tunnels. So while it looks like the walls in the image above are connected to the pillars, there’s actually an 80mm gap which is so that any vibration from the trains isn’t transferred into the structure above. Watching the trench under Albert St take shape from the surface has been fun to watch, but not as interesting as getting inside it and seeing it up close. One thing we discovered is that inside the trench is surprisingly quiet and peaceful. You don’t hear any of the noise or distraction from the street above the trench. The whole process of building the tunnels here was described as being a bit like a moving factory. At one end, workers are still busy digging out the trench and stabilising the walls. They then line the walls with waterproof membranes and build the proper floor slab. A bit further down the trench, large formworks are used to build the side walls of the tunnel. The formwork is on wheels so slides down the tunnel. You can also see the completed walls. At the very southern end of the trench, workers are now preparing to pour the first section of tunnel roof which is due to be poured in a few weeks. 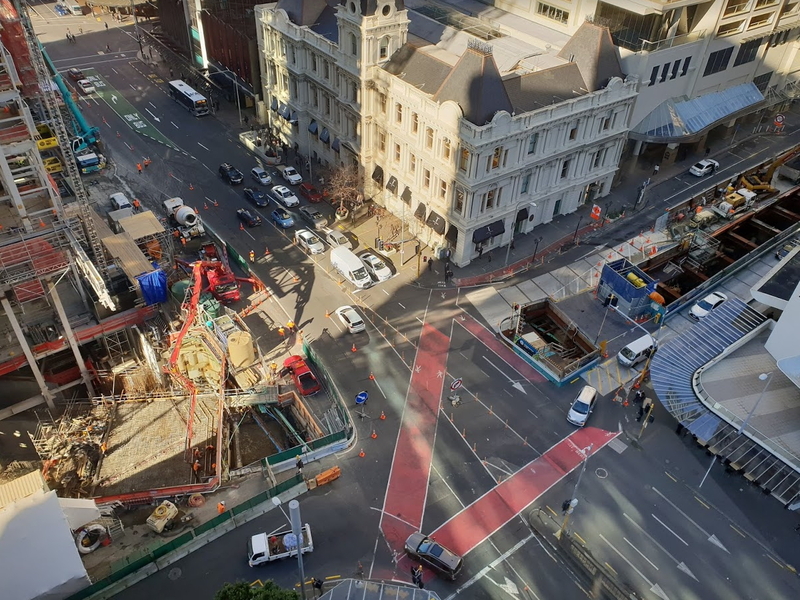 This process will snake its way north along Albert St until it reaches the intersection of Customs St where a different process will be used to connect to the tunnels under Commercial Bay. 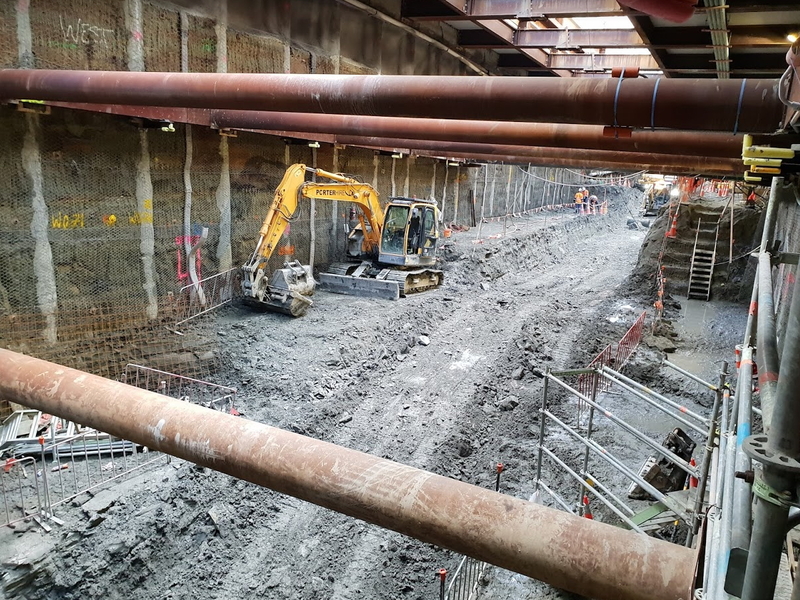 While most of the tunnels under Albert St are being built inside of a trench, and then filled in later, because of the fear of hurting vehicle traffic, to get under Customs St they will actually mine under the intersection. Apparently a much trickier and more dangerous proposition. As such, it is expected to take five months to build that 30m section. A good example of trying to maintain traffic flow at all costs. So five months of moderate disruption vs. how many months of just closing it and getting it done? That is something that really needs to be jumped upon by mainstream media. That said, I wonder how long it would take if they were able to redirect traffic. I imagine that it’d still take 2-3 months. Apparently Hosking nearly popped a vein at the prospect of any delays to traffic so they went with the mining option. How do you mine through muck? Isn’t that what they Bentonite for in Britomart? It would be a good “test” to show that closing Customs St to through traffic wouldn’t be such a disaster after all. 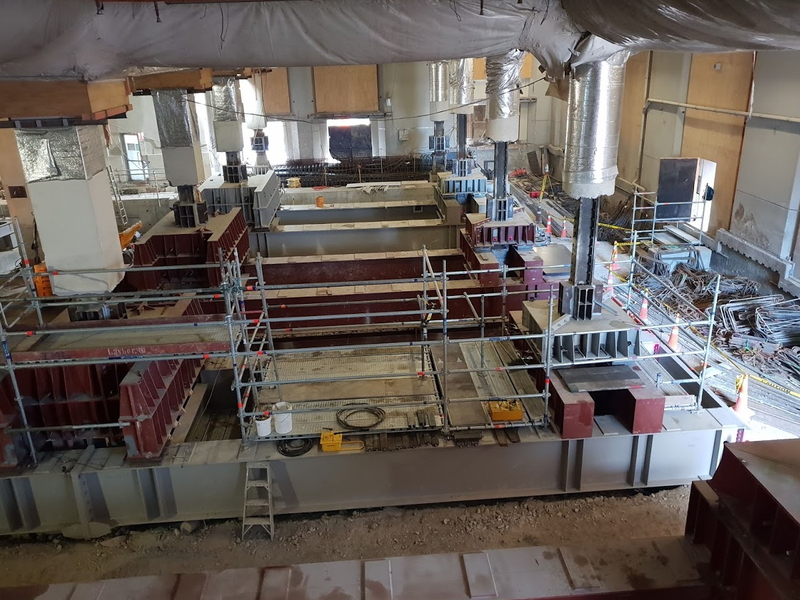 Thanks for the post – great to see – and good to see that video too, makes you realise just how hard it is to tunnel under an existing building. Huge amount of rework and nothing is simple. Did you take any video yourselves? Geoff Marshall from the Londonist does that when he gets taken down into new Crossrail stations – hugely interesting! Good to see the floor of the Old GPO getting reduced to ground level, I always hated the way it was built up in that awkward lump in the middle. But I think on a previous post on the building, it showed the existing stairs at the entry points in the centre, still being retained – which makes no sense to me. Can you shine any light on that? 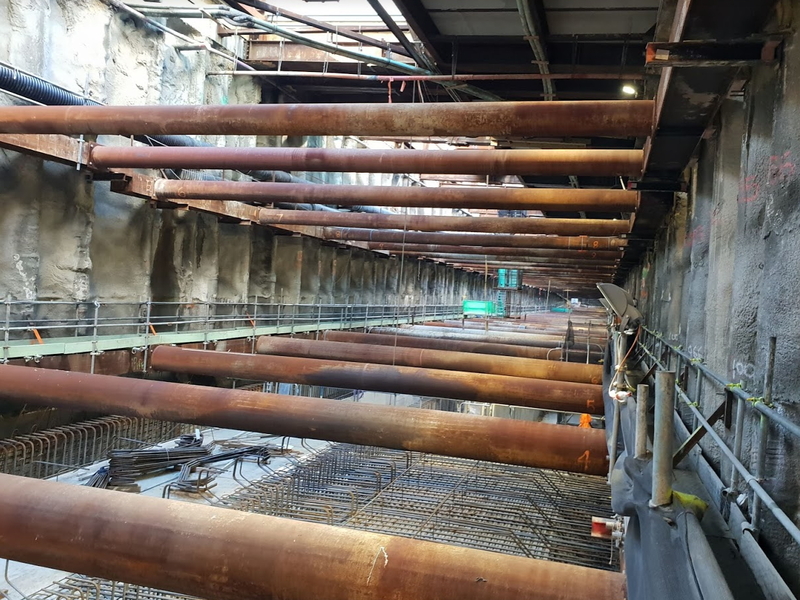 Finally – I see that there is going to be a level above the train tunnels but below the GPO floor – do you know if that is going to be inhabited (i.e. shops, walkway, etc?) or is it just going to be infilled with services etc? The video showed a new slab going in there, which seems to imply something new happening there? Any ideas? Probably just toilets, lockers and some seating, i’d imagine (like how it was before). It will be flat out to Queen St I believe. As for a level between the ground floor and tracks, they’re definitely but replacing the old pedestrian tunnel but possibly they’dt still be toilets etc. Geoff Marshall makes some really interesting videos alright, Shows a different side to London. How come they haven’t started boring the tunnels north from Mount Eden? Couldn’t that be done simultaneously with the Albert Street cut & cover? That’s part of the main works contract which was delayed after Fletcher pulled out of the tender process. Was restarted again recently but tender not likely awarded till next year. Also, can’t stays the bored tunnels till you start the stations. Does that mean we are looking at a decent delay to when the CRL will be completed? I thought the section under Customs was done when they closed and constantly moved the traffic lanes – was that just service realignment? The work involved is many miles away from my own field of engineering, but it made me smile. In engineering it can be very hard to connect with people and explain why things take time, unless they have the required background to not even ask the question in the first place. Giving you lucky fellas a tour was a great way to connect and let you see that real work is being done, not just money being squirreled away by contractors and consultants. I was really happy to see the state of the original steelwork – I honestly expected some pitting after all these years. 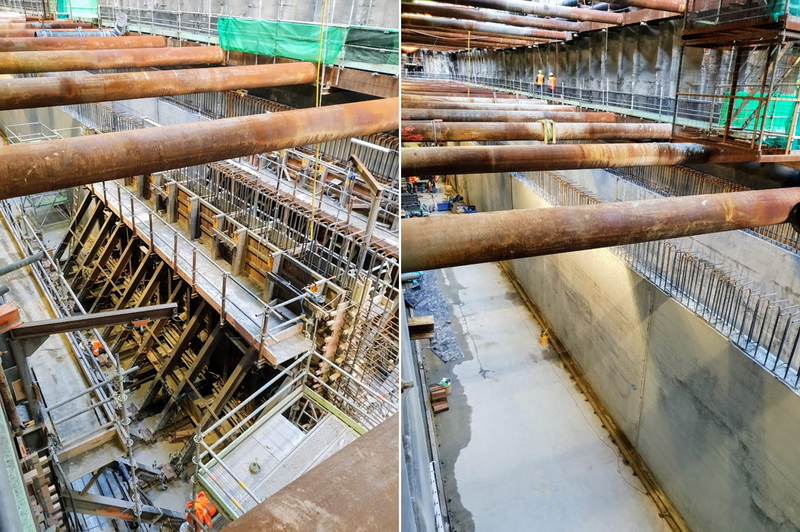 So it would seem that the tunnels from britomart to Aotea will be just about completed some five years before the CRL is due to open. Will rails be laid to Aotea to allow spoil removed by the tunnel boring machine to be railed out through Britomart? I doubt it, they wont allow freight trains in the tunnel and they’d be unlikely to build a spoil transfer facility to load freight in the middle of an urban station construction project. Most likely is they truck the spoil to the port yard and load it onto trains there, if it is going out of Auckland. Yes the tunnels up up Wyndham will be completed long before the rest of the project. They will be left empty as far as I’m aware. The fit out of the tunnels with rails, signals, overheads etc is a separate contact. Also, they can’t be used to remove spoil as the TBM drives will be from Mt Eden and head north towards Aotea. Five years of underground dance parties? Ready made raving space? Doosh doosh doosh all night long and no complaints from the neighbours…. While the public love to have little windows in, to see what is happening, even if on tippy toes…. the people on the inside really don’t like people spying in on them. So they’re quite happy not to…. Mining is pretty risky & dangerous, and I think avoidable. Example of the cut and cover sections of Singapore MRT through Chinatown, New Bridge Road 20 years ago. Steel beams and deck laid over road during night to maintain traffic. Normal cut & cover underneath. Secant walls could be done at night or with partial lane closures. Close the road and complete construction by the quickest and most efficient way. Traffic will soon find an alternative route and as the cursing will be contained within the car nobody will hear it……mostly! There might be issues you never thought of, such as fire and ambulance access. I mean, it’s easy to say that fire & ambulance could simply go around the block, but let’s take the absolutely worst case scenario – a building topples over either because of the CRL undermining it or because of an earthquake and takes out the access from the other end of Albert St. It’s prudent to plan for what *might* happen. This was also done for Oxford Circus on the for the construction of the ticket hall when the Victoria line was built. Yes, I remember that. They called it “the umbrella”. That was back in the 1960’s. My first thought when reading about the danger of “mining” under Customs Street. Imagine the time and money that would have been saved if they just close the intersection up. The material under Custom Street that they will be mining through is probably the same sandstone that the rest of Auckland sits on, and very easy to work, if it doesn’t get wet. Get it wet and it gains a life all of its own. Get it very wet and it just becomes a sticky slurry that glues itself to anything it comes in contact with.There have been heaps of service tunnels bored through that stuff, but they are running out of dump sites that are handy to town that can handle it. Great to see this. Building the tunnels into the foundations instead of just developing the site with no plan at all for rail and blocking off the possibility. Now let’s just have the same thinking down here in Wellington, instead of only planning for a ‘moar roads’ future. A fascinating insight into the construction works. It’s a pity that the Herald have shown so little interest.